The future America is an irradiated wasteland — a vast, ultraviolent world where criminals control the mean city streets. 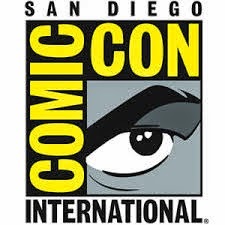 Ultimate law enforcers like Dredd (Karl Urban) and his new partner, Anderson (Olivia Thirlby), are Judges — the only force battling for justice. 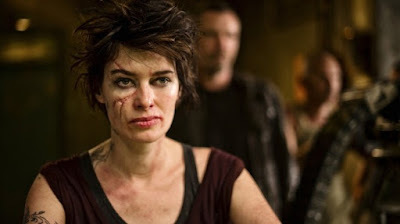 Dispatched by the central authority, the Judges’ target is Ma-Ma (Lena Headey) a ruthless boss bent on expanding her criminal empire through sales of Slo-Mo, a dangerous reality-altering drug. With Dredd calling the shots, the two Judges declare full-scale war on crime in this unrelenting and brutal, three-dimensional thrill ride. This second adaption of the "Judge Dredd" comic series fares much better than the first one that starred Sylvester Stallone as it takes the character and the world much more seriously and with more respect. The end result is a much better movie and a better realized vision that fans of the series appreciated. The overall story is pretty much the same as it's set in a dystopian future where most of the world has been irradiated and only massive cities such as Mega-City One remain. The cities are so large and the populace is so desperate that thousands of crimes happen daily and the only force to stop them are the Judges who act as judge, jury, and executioner all in one. It's not long before they are called to Peach Trees, a 200 story slum skyscraper that's controlled by drug lord Madeline Madrigal (Lena Heady) who's known as Ma-Ma. Three people were skinned alive, drugged with Ma-Ma's favorite drug Slo-Mo, and dropped from the top floor to the atrium below as a warning to the other residents. Dredd and Anderson investigate and capture one of Ma-Ma's men named Kay (Wood Harris) and Anderson's psychic abilities let her know that he's the one that carried out the executions that they are looking into. 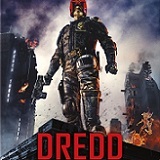 Dredd decides to bring him in for questioning, but Ma-Ma orders the building to be completely cut off from the rest of the word by sealing it shut which leaves Dredd and Anderson trapped in a building filled with Ma-Ma's men who have been ordered to kill them. 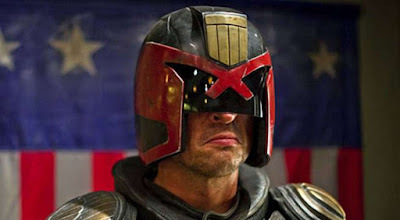 I liked this new version of Dredd and I thought Karl Urban did a great job as Dredd considering that he's got a helmet covering most of his face for the entire movie. 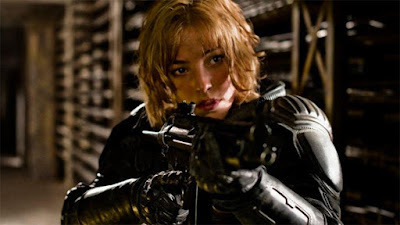 Olivia Thirlby also was good in her role and she managed to flesh out a character that could have easily just been another damsel in distress. Lena Heady seems to be enjoying her role as the ruthless drug overlord who enjoys her own product. And speaking of the drug, the visual effects in this movie (especially the ones depicting the effects of the drug) are pretty cool and original. The overall film plot may be one that we've seen before, but the way that it's executed is pretty original and made for a good time at the movies. This 4K presentation transferred in 2.40:1 from the original 2K source looks pretty good and it's better than the 1080p Blu-ray for sure. Lionsgate released this movie and Ex Machina on 4K at the same time, but Ex Machina looks a lot better between the two. The highlight of this presentation is without a doubt the hallucinatory drug sequences which offer vivid colors and a distinct haze that's perfectly sharp and detailed. Detail overall is very focused and the black levels are deep and solid. 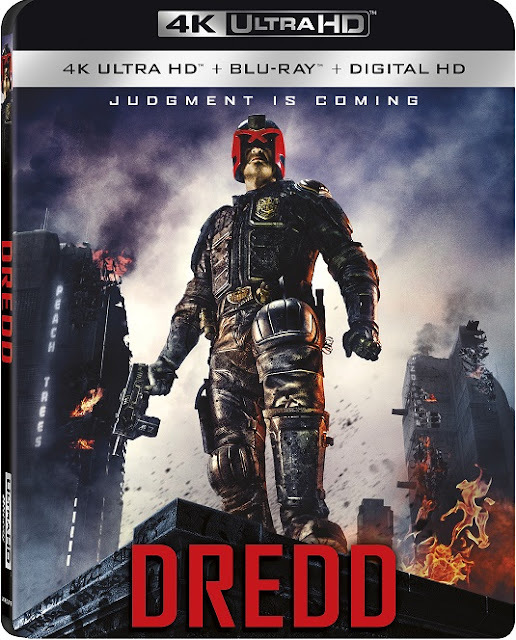 Dredd's Dolby TrueHD 7.1 mix is fantastic and it's even better than the stellar mix that the Blu-ray offers. It's a constant presence in the movie and it delivers on all fronts. The sound effects are well placed and lively, the dialogue is crystal clear, and the music is blended well with the rest of the sound palette. This mix will make fans happy! All of the extras from previous releases have been ported over to this set. All of them are in high definition. Mega-City Masters: 35 Years of Judge Dredd - Just under fifteen minutes long, this extra fives us a look at the history of the Judge Dredd character and his world with comments from co-creators John Wagner and Carlos Ezsquerra, artist Brian Bolland, 2000AD's Matt Smith, and more. Day of Chaos: The Visual Effects of Dredd - Visual Effects Art Director Neil Miller and Visual Effects Supervisor Jon Thum share how the visual effects were done as well as talk about the new 3D camera that was invented for this film and how they achieved the super cool drug sequences that were shot at high speed. 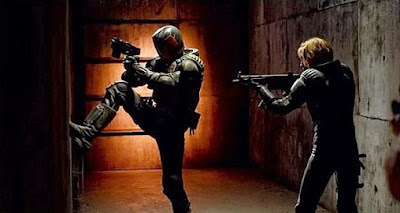 Dredd Featurette - An extremely short look at the film. Dredd's Gear - A quick look at the Judge Dredd costume and props from the movie. The 3rd Dimension - We hear from Producer Andrew MacDonald, Cinematographer Anthony Dod Mantle and Lead Stereographer Vincent E. Toto about the film's 3D presentation. Welcome to Peachtrees - A look at the mega block location that's the focus of the film. Dredd Motion Comic Prequel - A short motion cartoon that provides the backstory on Ma-Ma's rise to power and the development of the Slo-Mo drug. 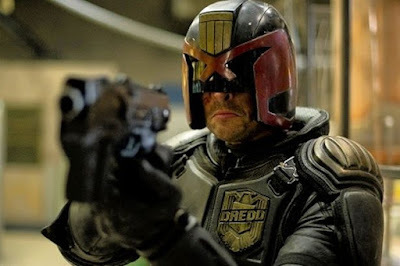 I liked Dredd and I wish another sequel had been made but there's rumblings of a television show picking up where this movie left off. The cast are all great in their roles and the action and the visual effects for the movie are fun to watch. The Blu-ray offers some great video quality and a stellar audio mix as well as some decent extras. This movie is recommended.